Carrying out a fast track contract, materials handling and niche process plant specialist, DemcoTECH Engineering, designed and supervised construction and commissioning of a materials handling system for the disposal of dry tailings at Liqhobong Diamond Mine in Lesotho in less than a year. The contract, covering design, engineering, supply, erection and commissioning supervision, was awarded to DemcoTECH by Turnkey Civil Lesotho, on behalf of diamond-producer Firestone Diamonds, who holds a 75 percent interest in Liqhobong, with the remaining 25 % owned by the Government of the Kingdom of Lesotho. 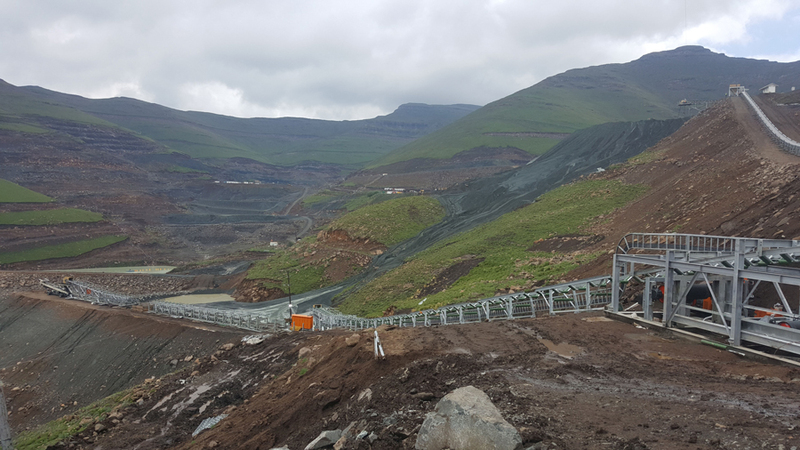 The contract brief called for a system to dispose of between 3 and 4 million t/yr of dry tailings, and capable of withstanding the extreme weather and rugged mountainous conditions at high altitude in Lesotho, while at the same time being completely re-routable or extendable. 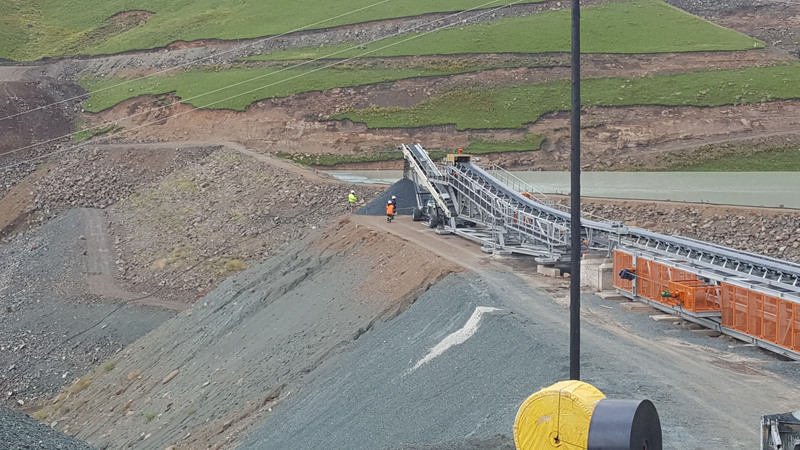 The first route comprised of a downhill conveyor, transfer house and mobile slewable stacker, which became operational in November 2016, just 8 months after the contract award in March 2016. The second or main route was operational by February 2017. 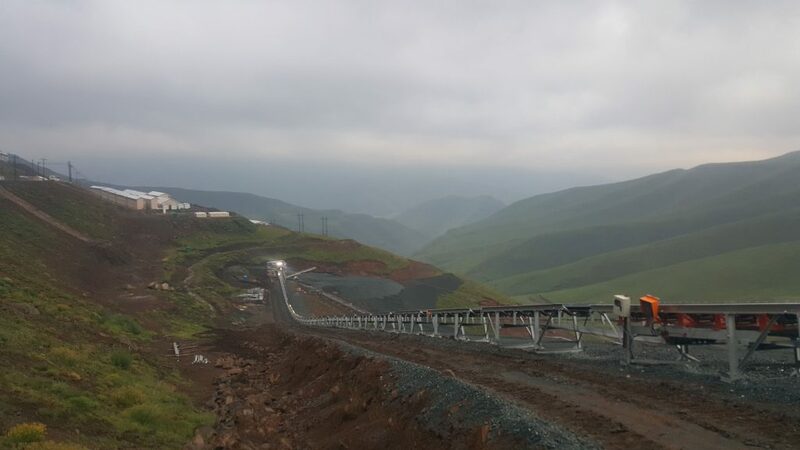 These tight contract deadlines were met despite the challenges posed by access to and working in the high altitude location of Liqhobong (2,600 m above sea level), the requirement for special engineering solutions, inclement weather and the demanding terrain. DemcoTECH designed advanced features into the system, including a belt storage system, enabling the entire system to be extended by 60 m within a 24 hour time period. The tailings disposal system consists of a fixed downhill conveyor rated at 700 tph, which is equipped with a regenerative electric-hydraulic braking system to prevent the conveyor from running away. In addition, a 20 m mobile slewable emergency boom is part of the standby route, while other components of the system include a 120 m-long retractable conveyor, a 450 m-long extendable conveyor inclusive of the belt storage system and a slewable 15 m mobile stacker that is 4-wheel driven. This allows the machine to be self-propelled. The ability of the 450 m-long extendable conveyor’s belt storage system to extend the conveyor by 60 m increments reduces the number of belt splices, thereby reducing the standing time when the head station, also mounted on a pontoon, is pulled for repositioning using mobile equipment such as a front end loader. The head of the conveyor feeds onto a mobile, self-propelling slewable stacker, mounted on rubber tyres and equipped with hydraulic drives, which can be repositioned by remote control. While DemcoTECH is a local South African based operation, it has also seen considerable success internationally. It has recently been awarded a contract for a sulphur handling system in Malaysia, following the successful completion of other offshore work which has included the detailed design for an import terminal at Port of Ploce in Croatia, handling both iron ore and coal, though to the very large contract for the multimillion-dollar iron-ore import/export facility in Lumut, Perak, Malaysia,. Taking a number of years to complete, this giant complex for Brazilian major mining group Vale included an ore storage yard and a marine terminal with a 60-million-tonnes-a-year capability. DemcoTECH Engineering is a specialist bulk materials handling and niche process plant company, offering services from concept design through to project completion to the power generation, cement, mining, metallurgical, manufacturing and port handling industries. Services include conceptual design, feasibility studies, design, engineering, procurement, expediting, construction and commissioning. Plant supplied by DemcoTECH includes troughed conveyors, air-supported conveyors, pipe conveyors, rail-mounted slewing boom stackers, pivot boom conveyors and mobile conveyors. After-sales services include spares, maintenance, refurbishments and operational readiness packages covering procedures, systems and workplace tools required to successfully operate and maintain a new or upgraded plant. The fixed downhill conveyor is equipped with a low speed regenerative electric-hydraulic braking system to prevent the conveyor from running away. The 4-wheel driven mobile slewable stacker is being fed by the 450 m-long extendable conveyor inclusive of the belt storage system.